The clerk I talked to had no idea what I was talking about. He reluctantly brought over the manager. She had no idea what I was talking about. She stared at the offer on the screen and couldn’t figure it out. She tried calling another store. Again, no idea what was going on. Then she called Radio Shack’s POS support line and was on hold for about 20 minutes. If I were an ordinary customer, I would have been fed up and left. But I like to see how these things play out and consider it market research, so I let it go on. I amused myself as the manager spent her time on hold trying to sell me batteries, extended warranties, screen protectors, armbands and pretty much anything else that was within reach. I asked if she could just override the system and add the discount. No, store managers don’t have that discount. Finally, she randomly entered promotion codes and figured it out. Thirty minutes after I entered the store I left with my iPod. During that time she couldn’t help other customers. It was’t a great experience for me, the other customers, the store or foursquare. This isn’t limited to foursquare or Radio Shack. 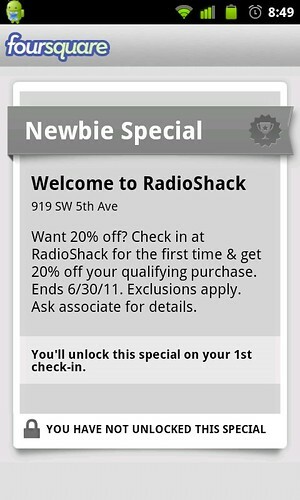 I run into this all of the time when trying to redeem mobile offers. My default expectation is that it won’t go smoothly. That’s one thing that appeals to me about Square’s Card Case and Register. Because the POS system is integrated with loyalty rewards and promotions, here shouldn’t be a disconnect between the offer that I see on my screen and what the merchant sees on hers.